Nissan is planning to create the smartwatch to specifically merge a driver's biometric data with their NISMO vehicle. 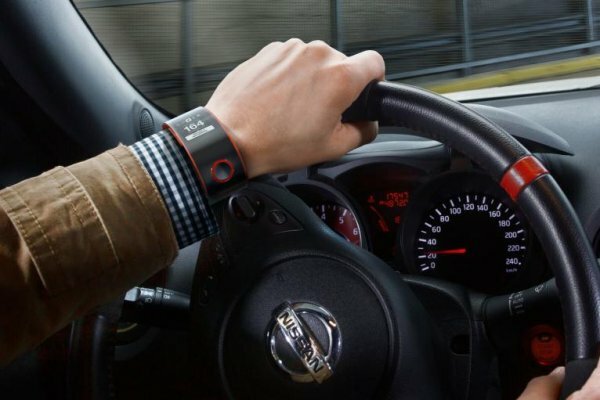 The Nissan Nismo Concept Watch was unveiled yesterday at the Frankfurt Motor Show to conceptualize the idea of the wearable driver-and-car technology bridge. * Monitoring vehicle efficiency with averages for fuel economy and speed. * Access in-vehicle telematics and performance data when in track mode. * Connect the car and smart phone with the watch through Bluetooth Low Energy. * Capture the driver's biometric data through a heart rate monitor. * Receive tailored car messages from Nissan. The watch is being developed with two thoughts in mind: as an accessory for serious Nissan NISMO fans and as a useful data port for Nissan's NISMO racing team for on-track performance enhancement. The Nismo Concept Watch is one of the first things to come out of Nissan's new Nismo Lab. The Lab was also responsible for the cutting-edge JukeRide performance analysis tool that captures live biometric and telematics data from NISMO athletes during races. The watch will become the consumer's version of the more complex systems Nissan's racing teams employ. Nissan plans to further enhance these technologies through research into adding capabilities for electrocardiogram (ECG), electroencephalogram (EEG), and skin temperature and hydration readings. By perfecting these for real-time use, in a vehicle, and in wearable form, Nissan hopes to help improve the performance of athletes in moto racing and other sports. The consumer version of the Nismo Watch Concept will be available in black, white or black and red. It employs a snap-fit mechanism for attachment to the wrist and is controlled by two buttons and a simple user interface developed for the watch. Its lithium-ion battery will be capable of over seven days of use under normal conditions and is recharged through a micro-USB slot. Nissan did not say when the watch will become available, which markets it will be available in, nor pricing information for purchase.